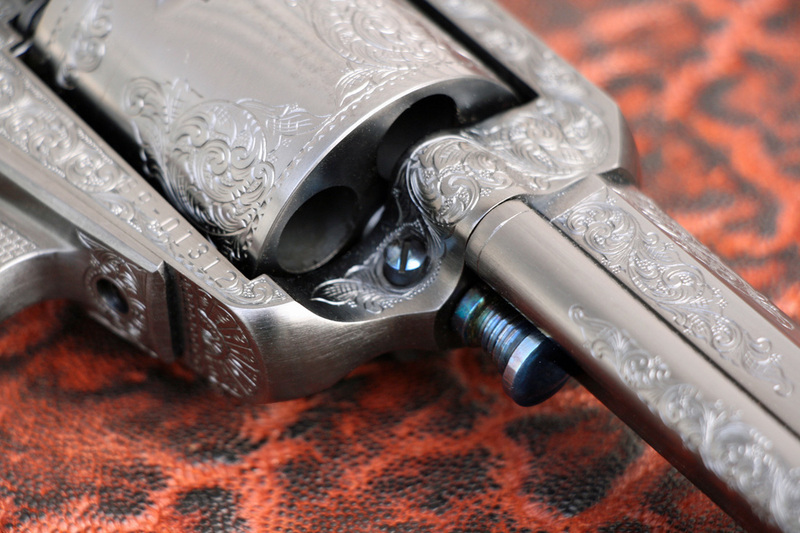 I have dreamed of custom sixguns since childhood, probably about the time I discovered the articles of John Taffin and Ross Seyfried in the mid-1980’s. 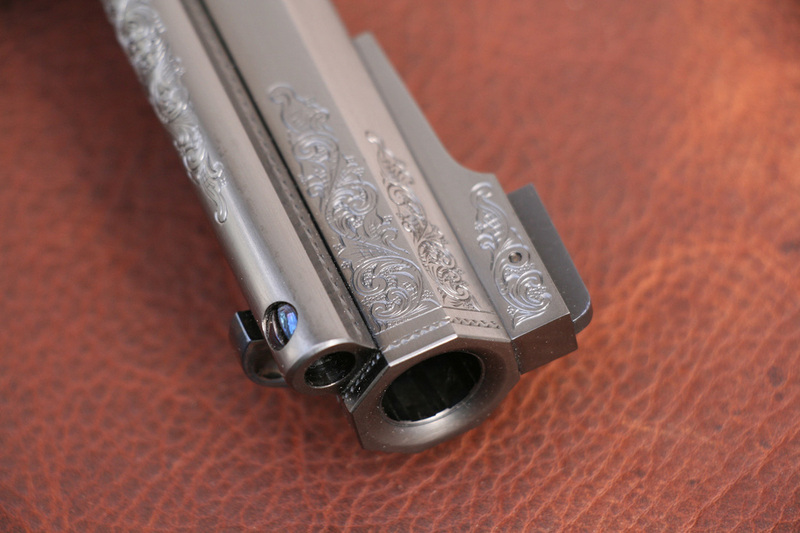 In the time since those formative years, there have been several mild custom guns commissioned by various talented gunsmiths. The results of those projects only served to whet the appetite for what was surely to come. While I have always had thoughts of doing something like this, the project was never more than a pipedream until late in the winter of 2014. My wife and I were settling in for the night and no matter what I’m doing, thoughts of the next custom gun are not far away. Off the cuff I said to her that I’d like to build one really nice sixgun. Something one of a kind, sort of a Holy Grail of dream guns. She asked me how much it would cost to build and I gave my best guess. To which she told me that as long as our bills were paid and money was being saved towards our future, have at it. Sounded like a plan to me! I’d had in mind to do a five-shot Ruger Bisley for quite some time and set about planning the build. I decided to go further than I originally planned, replete with engraving, ivory and Turnbull finishes. This sixgun was to be heavily influenced by both the Elmer Keith #5 Colt and Ross Seyfried’s Bowen #13. 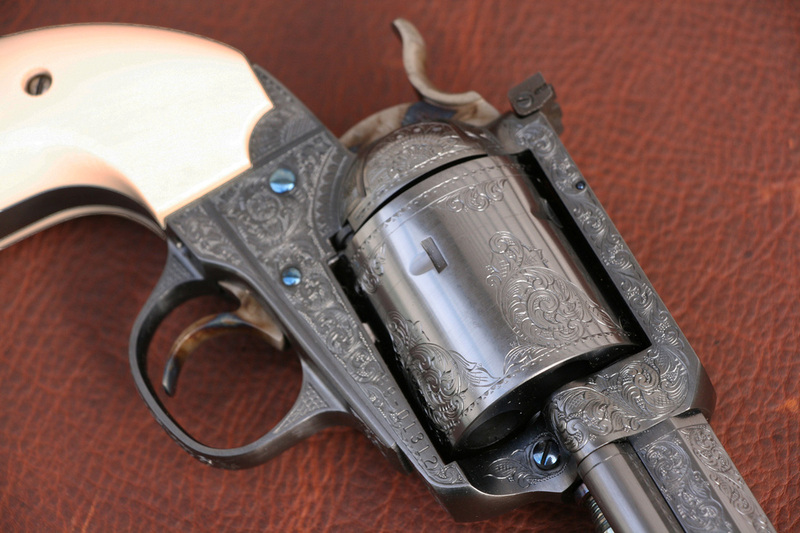 I had tested the waters the year before with one of my favorite sixguns, a Cimarron 1871-1872 Open Top .44Colt. In a project that took only a matter of weeks, the gun was sent off to Michael Gouse to be engraved in the style of Cuno Helfricht at 75% coverage and then refinished in carbona blue with color case hardened hammer, trigger and fire blue screws by Doug Turnbull. The result was simply stunning. This was no accident; it was intended to be the precursor for what I was now planning, which would be a much more involved and far more costly undertaking. Choosing a gunsmith can be as challenging as choosing the gun you want to build as there is a lot of talent available to us these days. I had used several good `smith’s in the past but the one that stood out as the perfect choice to make this dream a reality was one I hadn't used before, Jack Huntington. I had handled several of his guns and shot a very beautiful .500Maximum he'd built. His work appeared to be extremely well done, if not flawless! In the spring, I contacted Jack to discuss my options and get the ball rolling. 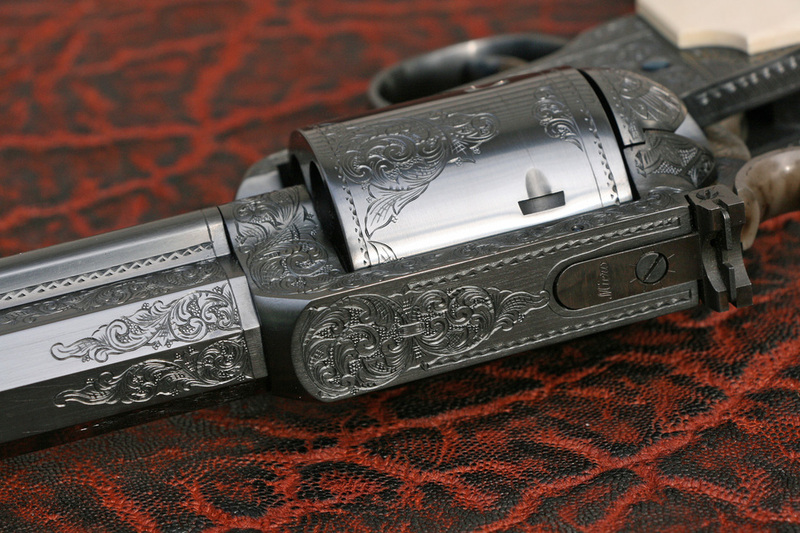 I knew I wanted the gun to be engraved and finished like the aforementioned Cimarron. I also knew I wanted a 4 5/8” octagon barrel. While early on, the .475 had proven to have an advantage on heavy game, what I really wanted was a .500. The Linebaugh cartridge was the most romantic choice, having first read about it in Seyfried’s Gun & Ammo articles in childhood. However, being relegated to commercial cast bullets and having no desire to cast my own, it was ruled out due to limited selection. The .500 JRH, on the other hand, shares bullets with the .500S&W and with that cartridge’s considerable success, there is a far greater selection of commercial cast bullets available. A 440gr LBT at 1350fps sounded mighty potent to me! The .500JRH seemed the natural choice. Now on to the details. A browned damascus barrel like the #13 was considered but that would really only be appropriate with a color case hardened frame and I wanted this sixgun to be full carbona blue. So the damascus barrel will have to wait for another project. I also strongly considered doing something with the top-strap, such as the Old Model Single Six or Colt Flat-top Target styles with dovetailed sights. I’d seen the Single Six conversions by Hamilton Bowen and Allan Harton and the result is what I consider to be the pinnacle of elegant top-strap/rear sight conversions. In the end, this was going to be a very fancy but also a very practical sixgun so to retain utmost utility, it was decided to use my 50th anniversary .44Mag Blackhawk “flat-top” and retain its factory top-strap configuration. It was sleek and already had a very good steel Micro rear sight. While a well put together sixgun fitted with CLC maple burl grips, it was one that really served no purpose in my collection and it seemed the perfect candidate. One of my favorite aspects of building a custom gun is having it done exactly how I want, particularly when that involves unique custom touches. The opportunity was taken here with a few nice details. I really like the Belt Mt #5 basepin, in part due to its short head not inhibiting ejector travel but artistically, like the original #5 pin even better. It had a larger hourglass head and was a little more refined in its style but it was also overly long. With that in mind, a new basepin head was drawn up to resemble the original #5 head, only cut in half with a large, ribbed, easy to grasp head. A tightly fitted basepin needs no setscrew and one was not used here. The other special detail was to be the front sight. This one was drawn up similar to the express style of the Seyfried #13 front sight, except a little shorter in overall length and a little lower in height but still with enough real estate to accommodate a little engraving. I also elected to have Jack weld up and checker the hammer spur, clean up and refinish the rear sight, as well as fit an ejector with a crescent shaped head. From the very beginning, I had in mind that this was to be a sixgun that would eventually be carried to Africa on both plains and dangerous game hunts. I still enjoy hunting with rifles so this would probably be in a backup role and because like many Americans, I prefer to have a sidearm when in the field. While ivory had never been on the menu in the past due to cost and the fact that I thought I always had time, it was the only grip material deemed suitable for this special sixgun. A call was made to Gunner Products in Florida to procure some ivory slabs. With a looming ivory ban and for the sake of future use and travel, an insurance policy was put in place in the form of an extra set of grips in antique paper micarta. There was still some micarta left over from previous projects and it was also included in the package sent to Huntington. In March 2014, the gun, along with slabs of ivory and micarta were shipped off to Huntington’s shop. Typically, this means all one has to do was wait but I still had work to do. A friend suggested that such a special custom sixgun deserved to be paired with a fine custom knife. What a grand idea, I knew just the guy! I first became acquainted with knifemaker Russell White in September the year before. He had a table set up at an outdoor show in Tupelo, MS and his work was so impressive, I wanted to buy all he had. In the spirit of self-control, I chose only one knife to bring home, a gorgeous 10” bowie made from spring steel and burl walnut. All along I had wanted to buy more from Russell so this was the perfect opportunity. An email was shot out to Russell, who lives only an hour away, with a few questions. Details were discussed and because this was to also be a very practical “using” knife, it was decided to do a 6” bowie in hand forged damascus steel. The guard was to also be damascus steel with ivory from the same tusk the Bisley grips were to be fashioned from.